WASHINGTON (CNN) -- An attorney for convicted Washington-area sniper John Allen Muhammad, who is scheduled to be executed November 10, will seek clemency from Virginia Gov. Tim Kaine on October 22. 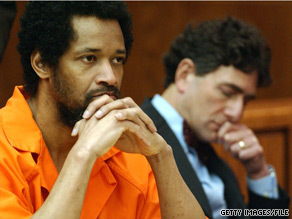 John Allen Muhammad listen to testimony from victims' relatives during his 2004 sentencing. Jonathan Sheldon said he will also file an appeal to the U.S. Supreme Court on November 2. He posted the dates Tuesday on his law firm's Web site. During a three-week period in October 2002, police say, Muhammad and young accomplice Lee Boyd Malvo shot 13 people, killing 10. Malvo, who was 17 at the time, was convicted in one shooting and was sentenced to life in prison. Muhammad is to be executed for the murder of Dean Harold Meyers at a Manassas, Virginia, gas station. Meyers was killed by a single bullet, which became the signature of the two-person sniper team. Kaine told CNN affiliate WTOP Radio during its "Ask the Governor" program last month that he couldn't imagine a circumstance under which he would grant clemency. "I know of nothing in this case that would suggest that there is any credible claim of innocence or that there was anything procedurally wrong with the prosecution," Kaine said. Under Virginia law, condemned prisoners can choose to die by electric chair or by lethal injection. If the inmate does not state a preference, he or she is executed by lethal injection.